The Port Campbell National Park is a protected national park in Victoria, Australia, 190 kilometres south-west of Melbourne; featuring an array of sheer cliffs overlooking offshore islets, rock stacks, gorges, arches, and blow-holes. 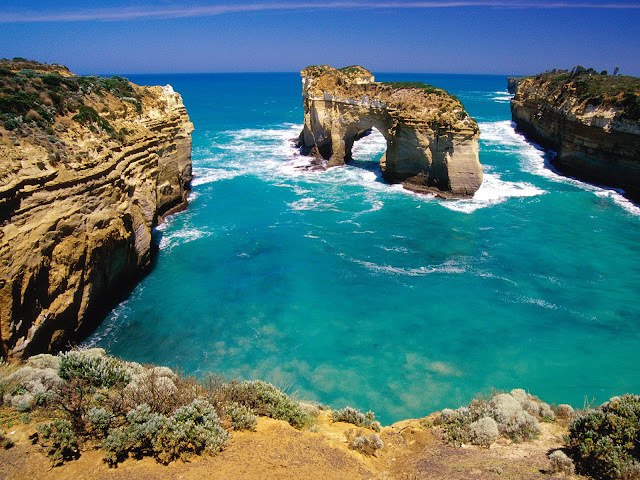 As part of the Shipwreck Coast, it hosts several tourist attractions; including The Twelve Apostles, the London Arch (formerly London Bridge), Loch Ard Gorge, the Gibson Steps, and The Grotto. The park is subject to salt-laden air, and the cliff-tops are particularly exposed to the harsh weather conditions from the Southern Ocean. However, fragile grasslands and heath-lands are still able to develop, supporting plant species such as sun orchid and spider orchid[disambiguation needed]. In protected areas, plant life includes beard-heath, bower spinach, coast daisy bush[disambiguation needed], daisies and cushion bush. The wilder terrain hosts an assortment of she-oaks, dogwoods, correa, messmate, trailing guinea-flower, woolly tea-tree and scentedpaperbark. The fauna in the park is largely ornithological; and includes honeyeaters, southern emu and fairy wrens, swamp harriers, rufous bristlebird, peregrine falcons, pelicans, ducks, black swans and egrets. Penguins, terns and dotterels are located along the shoreline, with hooded plovers nesting in exposed locations. Australasian gannets, wandering albatrosses and short-tailedshearwaters live out at sea. Land animals in the park include southern brown bandicoot, swamp antechinuse and echidna.